With the release of iPhone 8/8 Plus and iPhone X, Apple has finally joined the wireless charging revolution, which caused a quick and thriving development in the wireless charger market. At the iPhone event last year, Apple announced that it would have a wireless charging pad of its own, AirPower, which is built with the Qi standard and will allow you to charge your iPhone, Apple Watch, and Airpod earbuds all at the same time, but it hasn’t been released yet. The main reason for its absence is because of an overheating problem during charging since AirPower is not equipped with an active cooling function. So if it were to charge three devices simultaneously it would overheat. These days there are many wireless chargers that support charging iPhone 8/8 Plus and iPhone X, but actually there are only a handful of wireless chargers that can keep the mobile phone being charged over high output power for a long time. Overheating during charging is the most common problem that lowers the output power. In the following, let’s discuss the effect of cooling function in wireless chargers and how it affects the charging output power and time. Three wireless chargers from Mophie, Belkin and Tronsmart will be tested to compare below. Let’s start off by explaining why a cooling function is very important for a mobile phone charging accessories, especially for wireless chargers. For instance, when charging a mobile phone with a wireless charger there is a critical temperature value. 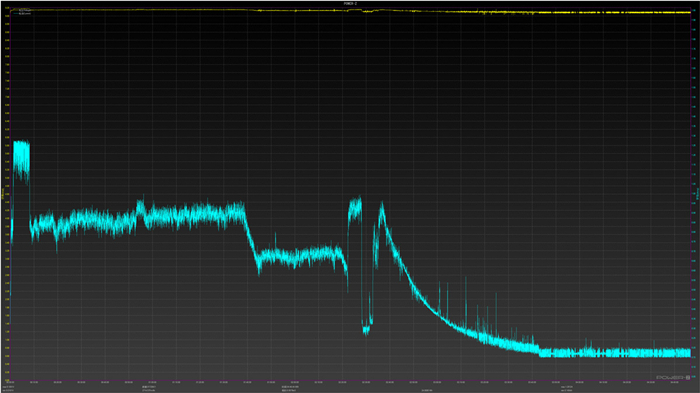 If the charging temperature exceeds this critical value, the output power will go down and impact the charging speed. But if your wireless charger is equipped with a cooling function then the charging temperature can be kept lower than the critical value. 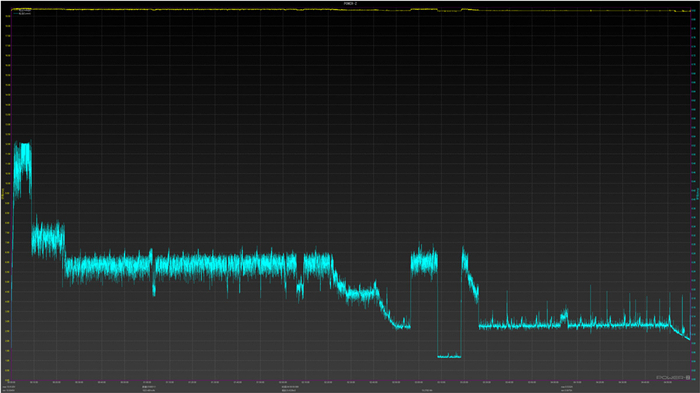 This results in the output power being maintained at a constant and stable level and faster charging times. Compared to other conventional chargers with cooling, the wireless charger from Tronsmart is equipped with the built-in cooling fan to prevent your device from overheating and slowing down during charging. This cooling design allows the mobile phone and wireless charger to dissipate charging heat at the same time. The three wireless chargers we tested all declare that they support 7.5W wireless fast charging for iPhone. Besides the apparent different appearance of the product, the most important distinction is whether there is an active cooling function or not. Let’s check them via specific comparison tests. The testing tools include ChargerLAb POWER-Z wireless charging tester and ChargerLAB POWER-Z KM001 multi-channel temperature tester and incubator. First up the ChargerLAb POWER-Z wireless charging tester is used to confirm the three wireless chargers support Apple 7.5W or not. This ChargerLAb POWER-Z wireless charging tester is equipped with 5W, 7.5W, 10W charging modes. Set 7.5W to test, if it’s supported the fast charge buzzer will make a sound and the display power will be above 6W. Mophie wireless charger first. When the wireless charging tester was put on it, the 7.5W fast charging mode was activated quickly. 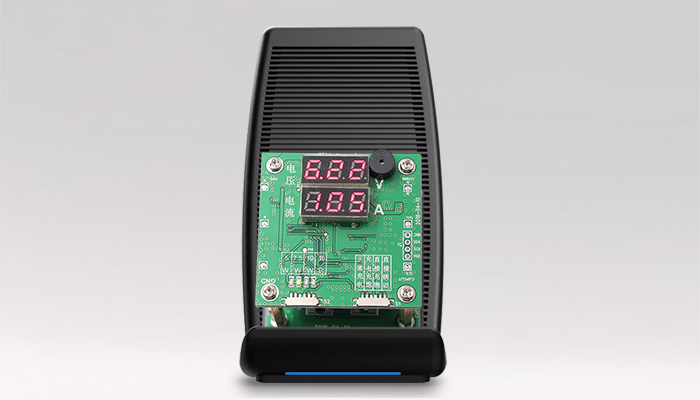 The display voltage is 6.15V, the current is 1.04A and the power is approx. 6.4W. The second wireless charger is from Belkin. Activated 7.5W fast charging as well. 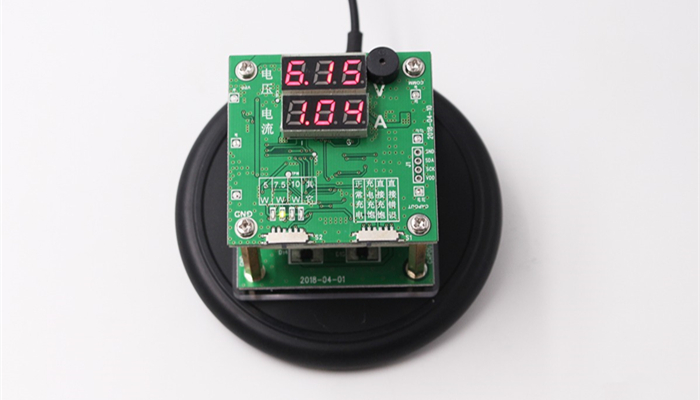 The display voltage is 6.16V, the current is 1.04A and the power is about 6.4W. The Tronsmart wireless charger also activated Apple 7.5W fast charging mode quickly. 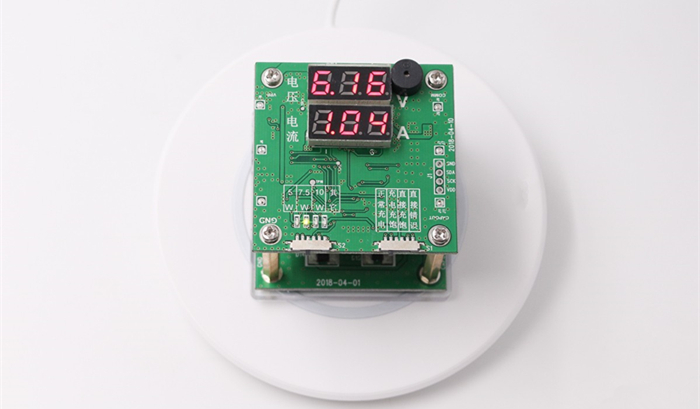 The display voltage is 6.22V, the current is 1.05A and the power is about 6.5W. 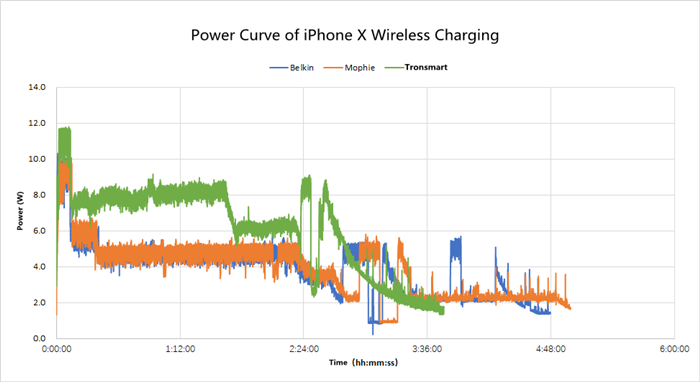 The charging voltage and current curve recorded by POWER-Z KM001 when Belkin wireless charger is charging iPhone X. 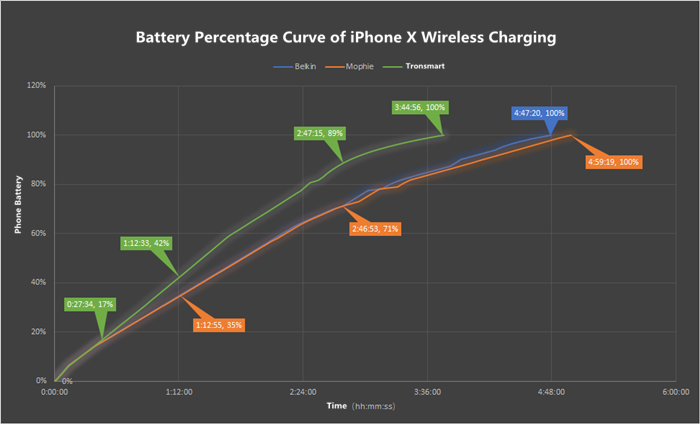 The charging voltage and current curve recorded by POWER-Z KM001 when Mophie wireless charger is charging iPhone X. The charging voltage and current curve recorded by POWER-Z KM001 when Tronsmart wireless charger is charging iPhone X. From the image above, it can be seen that during the first 27mins, three wireless chargers charge almost the same amount of power for iPhone X. But in 28mins the difference appeared. Because of the cooling performance of Tronsmart wireless charger, the change between fast and standard charging was stable. Compared to the Belkin and Mophie that don’t have a cooling fan, the change between fast and standard charging was unstable. Because of this, Tronsmart has the obvious advantage. The Tronsmart wireless charger fully charged the iPhone X in about 3 hours and 45 minutes, which is more than an hour faster than the other two wireless chargers. As for the temperature control, during the first 1 hour and 40 minutes, the temperatures of three iPhone X were similar. The highest temperature was kept at around 40°C. Although not much difference it can be seen that Tronsmart has a slight advantage. 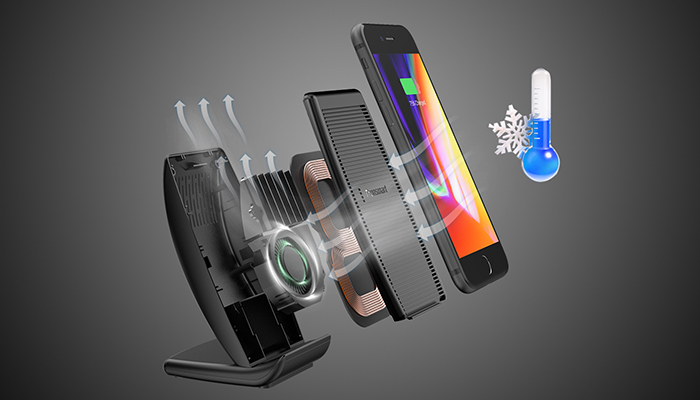 And then as the power of Tronsmart wireless charger dropped the iPhone X began to cool down as well. Dropping to 36 °C in 2 hours and 22 minutes. 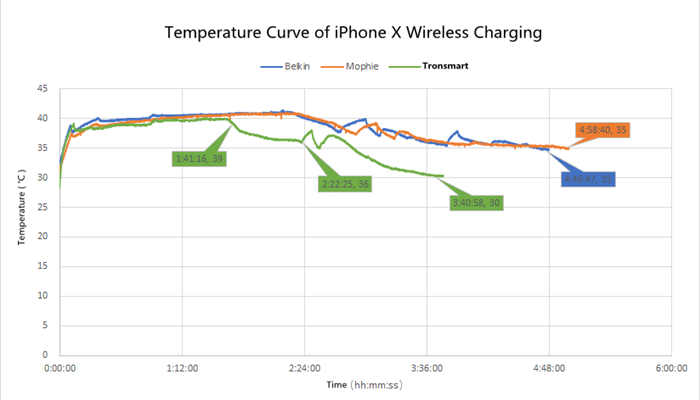 After the iPhone X was fully charged the temperature of it dropped to 30 °C, while the iPhone X on the other two wireless chargers was at 35 °C. In the end in terms of design, Mophie and Belkin adopt charging pad design which is light and easy to carry while Tronsmart adopts a vertical design that is also convenient to carry. 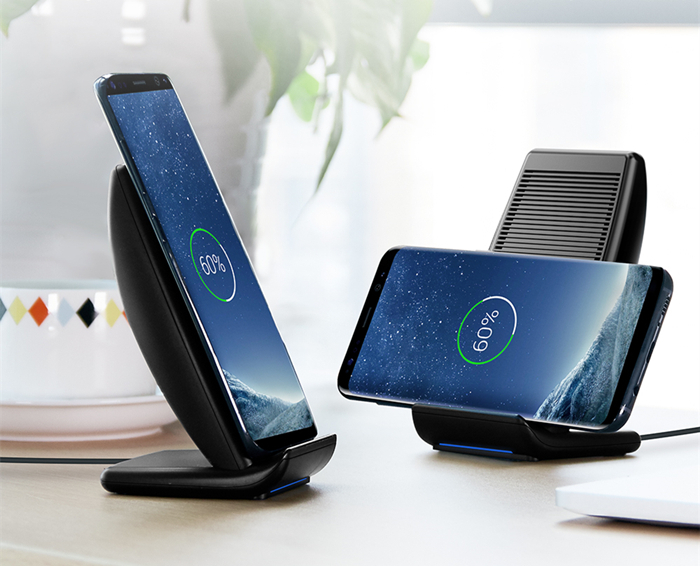 Tronsmart dual coil vertical wireless charger is suitable for office use as you can easily check the phone while working and entertainment like watching TV or playing games. In terms of charging the three wireless chargers all support Apple 7.5W fast charging. 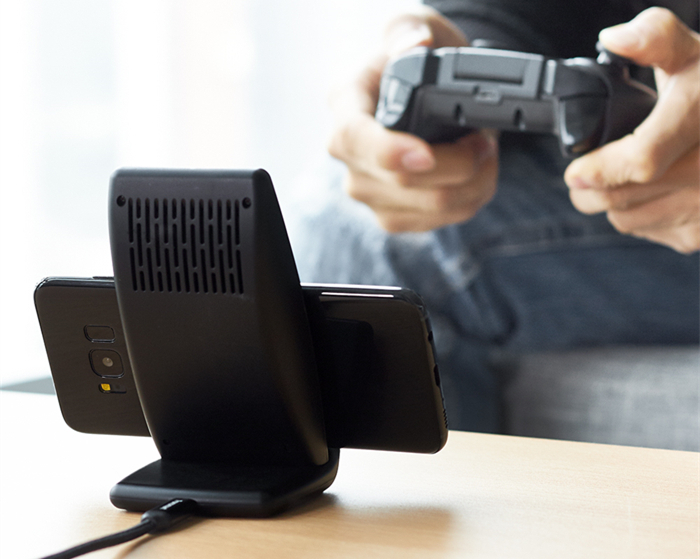 The built-in cooling fan in the Tronsmart wireless charger provides outstanding temperature control during charging, especially during the first 1 hour and 40 minutes. 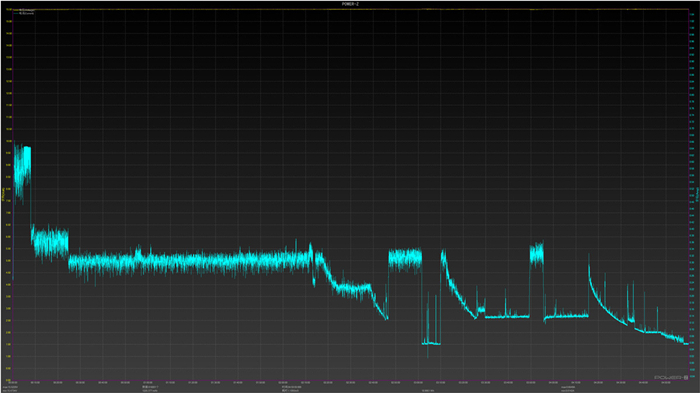 Controlled at around 40°C during high-power charging. Later when the output power reduces the temperature drops as well. It attributes to the powerful cooling fan. A built-in fan to keep the temperature down and the charging speed up. Tronsmart is nearly an hour faster to full charge the iPhone X than Mophie and Belkin.